The new PT709 makes for a perfect carry pistol. The new Taurus PT709 Slim 9mm semiauto pistol represents a significant departure from Taurus' existing pistol platform designs, embodying a unique combination of tried-and-true traditional compact-auto operating features with several 21st century innovations. It is an ultra-compact, recoil-operated, polymer-frame, striker-fired single-action with a manual safety, slide lock and excellent handling characteristics. At only 19 ounces, it may not be the smallest medium-caliber auto pistol Taurus has ever produced, but it is the slimmest, and it is designed specifically as a concealed-carry gun. I have long been a fan of the entire Taurus autoloader line, which up until about a dozen years ago put me in a minority among American handgun enthusiasts, who back then mostly viewed Taurus as a second-level overseas fabricator of inexpensive (and unreliable) clones of brand-name guns. That reputation was not really deserved then, and it is certainly not deserved now, because the fact is that Taurus today is a truly different company than it once was (see accompanying sidebar), and under the leadership and creative energy of Taurus' U.S. CEO Bob Morrison, it has emerged as a leader in handgun design. Trigger single action, 5.5 lb. Operationally, the PT709 has John Browning's classic recoil-operated mechanism, whereby the slide and barrel move backward a short distance together upon ignition of the fired cartridge until a camming lug on the bottom of the barrel engages a ramp imbedded in the frame, causing the rear of the barrel to unlock from the slide and drop slightly downward. This allows the slide to continue its rearward motion, against the pressure of the captive recoil spring/ guide rod system, extracting the fired case, resetting (recocking) the firing mechanism and then returning forward to pick up and chamber a fresh round from the magazine. The slide locks open after the last round in the magazine is fired. The slide/frame interface that supports this mechanism is distinctive. A solid steel cam block (or frame block) is held solidly in the polymer frame by the steel trigger pivot pin, reducing the number of moving parts in the system and minimizing the number of frame-weakening holes. The result is a strong steel-to-steel bearing surface between slide and frame, and slide-to-frame alignment and repeatability of lockup are enhanced by two sets of molded-in guide rails in the frame itself: one set immediately forward of the cam block that also houses the spring-loaded crosspin takedown lever; and one at the far rear of the frame. Compact polymer-frame auto pistol designs in general are frequently criticized for having an "insecure" frame/slide fit to the detriment of accuracy. Anyone who thinks this might be true of the PT709 needs only to look at the accuracy results in the accompanying table to realize otherwise. Mechanically, the spring-loaded striker-fired ignition system is completely reset by the action of the slide, so the PT709 is technically defined as a single-action design (meaning that the trigger pull does not contribute to loading the striker; it merely releases the already cocked system). However, the trigger pull feels like one of today's popular short-throw DAO guns--firm and smooth, with a positive travel distance, returning to the same stroke-length for every shot. ocked if the user desires. I've usually been wary of carrying small striker-fired single-action auto pistols (like the old "Baby Browning" .25 ACP, for example) cocked and locked because their safety mechanisms are small, lightweight and easy to slip off accidentally, and their trigger pulls are a bit too unstable for my sense of security. In fact, even when I carry a hammer-fired M1911 cocked and locked, I prefer to use a holster with a safety strap or thumb break that interposes between the cocked hammer and the frame. But the manual safety on the PT709 is particularly solid and secure, and the firm DAO-feel trigger pull makes this pistol the only one of its type where I would consider cocked and locked a viable option. NOTES: Velocity data is average of 5 rounds measured 10 feet from muzzle. Group-size data are averages of five five-shot groups for each load, fired at 15 yards from benchrest. As a further safety enhancement, the PT709 also features a passive internal firing-block system. A spring-loaded plunger in the slide automatically blocks firing pin travel unless the trigger is pulled fully to the rear, an action that raises a steel lever inside the right side of the frame and depresses the pin-block plunger, allowing the gun to fire. So an accidental drop of the gun onto a hard surface will not allow the firing pin to strike a chambered cartridge, no matter whether the firing mechanism is cocked or at rest. I'm also particularly impressed by the sights on the PT709. Most sights on ultra compact carry pistols are almost an afterthought, tiny and hard to see, as if their manufacturer thinks the gun will be only pointed instead of actually aimed. The Taurus Slim can definitely be aimed. The low-profile combat-style fixed rear sight and semi-Patridge front blade feature three large white dots for high visibility and quick acquisition, and the rear notch is wide and deep for ready alignment with the front blade--unlike the shallow narrow notches typical of many other similar-size pistols. The proof is in the shooting. The polymer frame has a hand-filling rounded backstrap and secure grasping grooves on the backstrap, front strap and forward sides. There are also grasping grooves on the rear sides of the slide to assist in chambering and clearing. The magazine release is conventionally located on the left side of the frame behind the trigger guard. The polymer baseplate of the steel eight-round magazine (which is a lot of firepower for a pistol of this size) fits smoothly into the bottom contour of the grip, with a slight forward extension that provides a secure control surface for the bottom finger of your firing grasp. The overall width of the grip frame is slightly less than one inch, making the PT709 thinner than any other 9mm pistol in its class and definitely entitling it to the name that is laser-etched into the slide: "Slim." First, remove the magazine and make sure the chamber is clear. Then draw the slide slightly to the rear and pull downward on both sides of the spring-loaded takedown lever, pull the trigger to relax the firing mechanism and draw the slide/barrel/recoil spring assembly forward off the frame. The barrel and recoil spring can then be removed from the slide for cleaning. To reassemble, you simply guide the slide assembly back onto the frame rails and press it to the rear until the takedown latch clicks back into place, and you're ready to reload and go. Simple. The first time I picked up the PT709 at a trade show, I immediately took to its comfortable feel and instinctive M1911-angle pointability--as well as the apparent quality of its DAO-like single-action trigger pull--so I was delighted when we received an early sample for review. I was able to put it through a function and accuracy review with eight different varieties of commercial 9mm personal-protection ammunition, firing from benchrest at a personal defense distance of 15 yards (about the width of a typical city street). The gun functioned flawlessly with all loads, and the overall combined group average was less than three inches. 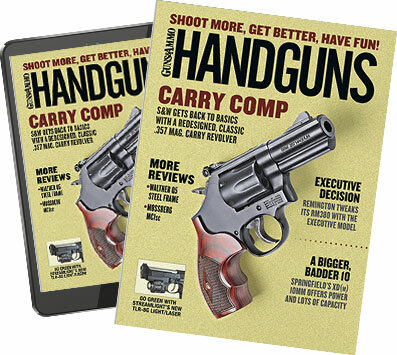 Put another way, you can hit a baseball-size target all day long with this gun at that range with anything you care to load in it, which is well within the specification standards of any law-enforcement agency, even for a full-size duty and service pistol. And it was as natural and comfortable to shoot as I had anticipated from merely handling it on the showroom floor. One of the advantages of any striker-fired auto pistol (as compared to hammer-fired mechanisms) is that the gun sits lower in the hand, putting the recoil axis of the bore closer to the line of the shooter's grip. For a lightweight compact centerfire pistol, this is a very important factor in controllability, perception of recoil and recovery time between shots. Combine the striker-fired low axis of recoil with an ergonomic grip like the PT709's, and you've got a pistol that handles like it was a much fuller-structured gun. If you're looking for a low-profile, lightweight 9mm auto that is utterly reliable, accurate above the norm and as convenient to carry as a wallet, the new Taurus Slim definitely ought to be on your short list of candidates.